Well, hello everyone! What a treat to be able to visit with people! Not that I find it difficult to express myself, even if I can’t speak human. My witch, Lucy Eagel, is a very intuitive sort and we get along just fine on the communication front. Mutual respect is key, of course, and the acknowledgement on both our parts that we are absolute equals. Okay, I admit it took a little while for me to come around to that view. After all, it’s part of a cat’s DNA to see herself as superior. I do so love my Lucy witch, though, and as I grow older I also grow wiser. At least I hope so. Perhaps I should clarify that I’m Lucy’s familiar. I'm a female orange tabby (a bit of a rarity indeed!) with beautiful yellow stripes, emerald eyes and a most elegant tail, even if I do say so myself. My name is Honeybee, and Lucy kindly named the bakery she and her husband Ben opened with her pastry chef niece, Katie Lightfoot, after yours truly. The Honeybee Bakery. It has a nice ring to it, doesn’t it? At one time witches were thought to actually turn into animals in order to escape from tormentors or to travel long distances. But that’s a bunch of hooey made up by scaredy humans who didn’t understand how benign the witches who lived on the edges of their villages could be. More than benign: helpful. After all most witches began their careers as herbalists and healers. Real familiars are companions, helpers and protectors. However, not every witch has a familiar. I mean, it’s not like you Google "familiars" and then order one online. It turns out that some people simply aren’t suited for the kind of bond a familiar requires. It's also possible that their familiar hasn’t found them yet. Oh my, yes. We always find our witches, not the other way around. Katie’s familiar found her the very first day she came to live in Savannah. It took a couple of days for her to realize Mungo belonged with her, and now she takes him with her almost everywhere. Even the bakery. It would drive me nuts if Lucy insisted on carrying me around in a tote bag, for heaven’s sake, but Mungo is a little Cairn terrier and he thinks it’s cute. Bah. Though I must admit he gets some really awesome treats at the bakery and hanging out with Katie full time does keep him from watching those silly soap operas he likes so much. Sheesh. Plus, in their latest adventure Mungo helps to save Katie from ... well, I guess you'll have to read the story. Anyway, the spellbook club – aka coven – that Lucy and Katie belong to has two other familiars – and neither of them are cats! I just don’t understand why cats seem to have lost interest in becoming familiars these days. Sure, Katie is allergic to us – gets all sniffly and takes a bunch of pills if I’m around, and whenever she stays over at Lucy and Ben’s townhouse she locks me out of her bedroom. I don’t like it, but I understand and try to give her a wide berth if I can. Jaida’s Anubis tracked her down when he was only a puppy. I bet she had no idea he’d get so big, but he’s a Great Dane and that’s what they do. Jaida lives with another witch, Gregory, and he doesn’t have a familiar. Anubis kind of steps in for Gregory if needed, but he’s really Jaida’s. He’s a regal beast, light on his feet, and very gentle with Mungo. Mungo looks up to him – literally, of course – but also as a kind of big brother and mentor. And Mimsey Carmichael has good ol’ Heckle. I still don’t know the story of how Heckle found her, but I know it happened way back when she was a teenager. Mimsey is seventy-eight now, and Heckle has been with her for over fifty years. Isn’t that grand? Of course Heckle is pretty obnoxious to the other witches, but he’s pretty good around us animals. I must admit I’m a bit jealous that he can actually speak human, but he usually wastes this extraordinary ability on harassing the other witches. The other spellbook club members, Cookie Rios and Bianca Devereaux, don't have familiars. Cookie seems fine on her own, but I have a feeling Bianca needs one of us. I'll be watching to see who finds her. It's always nice to have other familiars around -- but I hope whoever finds Bianca is properly feline! Bailey Cates believes magic is all around us if we only look for it. She studied philosophy, English and history and has held a variety of positions ranging from driver's license examiner to soap maker. She traveled the world as a localization program manager but now sticks close to home where she writes two mystery series, tends to her gardens and enjoys cooking of all kinds. Having apprenticed with a master herbalist, she's prone to concocting teas and tinctures from the stash of herbs in the corner cabinet in her office. She owns a working spinning wheel and is on a first name basis with several alpacas and two sheep with questionable dispositions. Bailey also writes the Home Crafting Mystery Series as Cricket McRae. 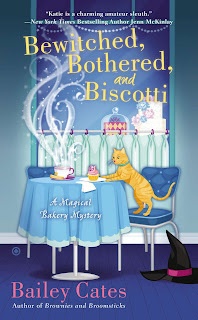 For more information on those and The Magical Bakery Mysteries featuring new witch Katie Lightfoot please see www.cricketmcrae.com. Tomorrow just can't get her soon enough for me to download this book!!! How do you familiars know how to be familiars? Do you go to Familiar School? Our person, Willow, is not a witch, but we like to be helpful. 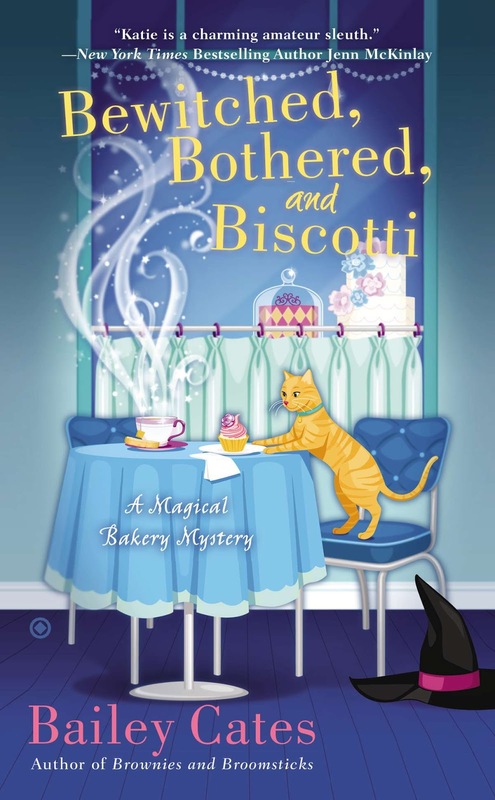 Added to TBR list as those felines always catch my attention. Thanks for this post, I loved reading it. I received word from Bookdepository that my pre-order is on its way, so I will have to wait impatiently for another 3 to 5 weeks for the book to reach me. Of course, if I went to England by bike to fetch it myself it would be faster. Happy to hear it, Sue and Jake! Sally & Tally, familiars are born with certain heightened abilities just like hereditary witches are. But let's face it -- all animals are highly intuitive and of course you want to be helpful. Willow's a lucky person to have you two! Aurian, where are you located? I do hope they hurry with your order! Lol, I live in Holland, which is "next door" to England where the Bookdepository is located. Just a bit of Ocean between the countries. This is definitely added on to my to be read list! A book with a tabby feline....can't wait! Ha! To Honeybee's dismay Mungo does get more "screen time". I believe in magic & I do love witchy stories. Happy to learn more about familiars.